A few months ago I posted a picture of a brass plate I was working on, which then got put back on the back-burner once again. Pulling it out a few weeks ago when I had five minutes spare I realised I'd made a daft mistake. 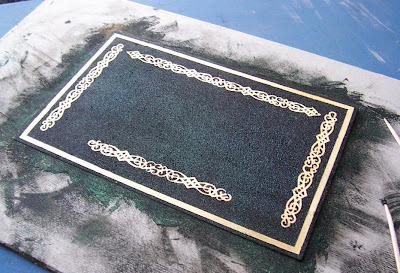 I'd forgotten to put a sealing layer over the initial brass before putting on the decorative paint coat. The masking I'd used to make the pattern had left some glue and grot, when I tried removing it it had only made things worse. Doubtless some people would say it adds character, but I know it's there and shouldn't be! It's taken me a while to decide to start a fresh, hopefully learning from my mistakes along the way - but then isn't that what arts and crafts is about? Here is a picture of the new bright and shiny brass plate. To make this brushed brass finish is actually quite easy and takes no time at all. If you pop down to Maplin's or an electronics stockist you can buy a rubberised polishing block which is normally used for degreasing and cleaning the copper on PCB's (printed circuit boards for the non-technical) prior to etching them or soldering components onto them. Their part number is HX04E http://www.maplin.co.uk/polishing-block-2109 if you want one too! 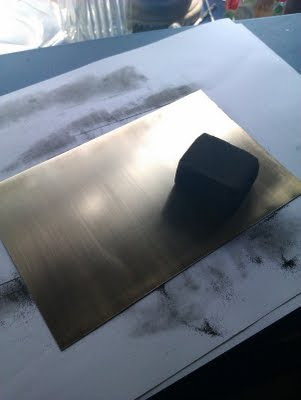 It works really well on many soft metals such as copper and brass, and lasts for years if looked after, although mine looks a little grubby from the dirt I took off this apparently clean brass sheet! To get a good finish it's just a matter of polishing in one direction, then the other, and back again a few times until you get the finish you like. Just make sure you keep it flat against the brass as you do, and go in nice long and even strokes. It's no good for really deep scratches, but will certainly buff up most boring bit of brass and copper. To help hold it use some double sided sticky take to fix to a bit of scrap card; saves those finger marks on the edge! (Neat trick I got from an instrument maker!) Brush off the remaining dust with a soft cloth, and lacquer or spray varnish to protect that finish. If you are feeling really fancy, after you've got a nice finish with the brushing marks going one way, using just the corner of the block make some figure of eights over the surface to produce a unique decorative look. If you don't like how it looks, just polish again to remove it! 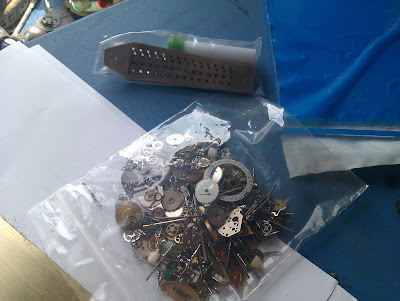 I'll try and post some more pictures as this comes along, and also explain what I'm going to do with the bag of cogs and this odd little (and surprisingly expensive) little metal gadget too. Busy Days, and get ready for news!